Dip Ritz crackers with peanut butter into chocolate to make this easy but yummy treat. 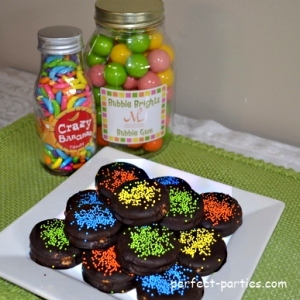 Add a few sprinkles to match the party colors or holiday and it is ready to eat! Put a generous amount of peanut butter between two Ritz crackers. 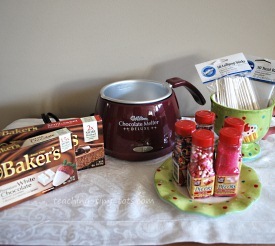 Use Wilton Chocolate Melter or melt chocolate in bowl. Since microwaves vary, times will vary. Heat until just melted. Chocolate should be warm not hot. Chocolate scorches very easily and will taste burnt if heated too long. Microwave 60 seconds on 50% power, stir well, and repeat 30 seconds at 50% power until melted. Dip Ritz cracker into chocolate using a slotted spoon or fork. Let excess drip off. Place on parchment or wax paper lined cookie sheet. Add sprinkles if you desire. For faster setting, place cookie sheet in the refrigerator for about 15 minutes or longer. Do not use Semi Sweet Chocolate, use milk chocolate or white chocolate. This pot made this so much easier! I'd definitely recommend getting this Wilton Chocolate Melting Pot if you enjoy dipping pretzels, strawberries and making cake pops. The metal portion or the pot can get hot so adult needs to be constantly monitoring. Do not get any water in your melted chocolate, this will ruin it. If you use white chocolate you can add a few drops of food coloring to change the color to match your party theme. 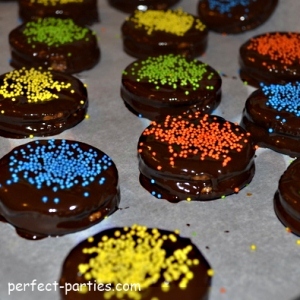 If you want to use colored crystal sprinkles, chocolate needs to cool a little or else you will not see the "sparkle".